The definition of insanity, according to Albert Einstein, is to perform the same task over and over and expect different results. 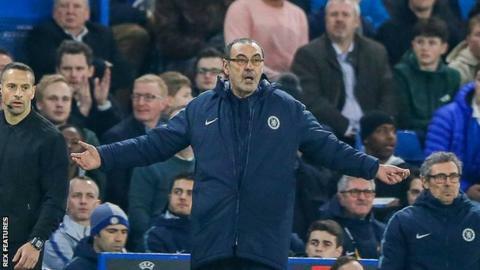 In Maurizio Sarri's case, the message does not seem to have got through for the past month, but during Thursday's 3-0 Europa League last-32 second-leg win over Malmo at least he got a break from his own fans. For the Chelsea manager, who has come under increasing pressure, Monday's FA Cup defeat by Manchester United was a nadir. Blues fans criticised his tactics, jeered his predictable substitutions and even joined in with the visiting supporters' chorus of "you're getting sacked in the morning". Thankfully for Sarri, the 3,500 Malmo followers who were otherwise raucous and knew a few choice English phrases, didn't know that particular ditty. On a night when it felt like Sarri's changes to the team owed more to Sunday's Carabao Cup final against Manchester City than actually taking on board any criticism, he did start crowd favourite Callum Hudson-Odoi - and praised the teenager afterwards. The 60-year-old Italian, who has denied a report in his home country that he has held talks about taking charge of Roma next season, could also use Olivier Giroud's breakthrough goal as 'exhibit A' in defence of his methods. But it seems there is still disagreement over Jorginho, who has become a lightning rod for criticism of his 'Sarri-ball' tactics, and was booed when he came on as a substitute. Sarri, though, said his team's poor start was down to the Italy international not being on the pitch. Asked what would happen if his side started in the same fashion against Manchester City on Sunday, opponents who beat them 6-0 in the Premier League earlier this month, he said: "Disaster." He added: "In the first 30 minutes we understood why Jorginho is very important for our team. We were in trouble exiting from our half. We played without confidence, we were nervous and we were unable to move the ball very fast. I hope that our fans will understand that he is a very important player." It might not have been the only judgement which left Chelsea fans scratching their heads once again. Why not play Kante in the Kante position? In his programme notes, Sarri said he understood "why fans were frustrated with results" but made no mention of his methods. And for those who have been longing for N'Golo Kante to play in the "Kante position", Sarri stuck to his principles and selected Mateo Kovacic in the deep-lying midfielder role. That decision nearly backfired when the Croatian midfielder gave the ball away in a dangerous position in the opening six minutes, only for Kante to make the telling interception. Yet a minute later it was the French World Cup winner who was racing clear to combine with Hudson-Odoi and set up Giroud for Chelsea's opening chance. And it was that combination which proved critical for the first goal, when Kante again made an interception midway in the Chelsea half, burst forward and fed Willian to set up Giroud. If the former Napoli boss was under any illusion he was back onside with the Chelsea fans, they soon let him know their feelings when he made his trademark substitutions following Ross Barkley's 74th-minute goal to make it 2-0. Ruben Loftus-Cheek replaced the effervescent Kante to cheers. Jorginho came on for Barkley to boos. The disagreement continues, but the real test may come in three days' time, when the Brazilian will have to make up for a poor display in that thrashing at Etihad Stadium. If the use of Kante was a feather in Sarri's cap, his sparing deployment of Hudson-Odoi was once again shown up, at least in the home supporters' eyes. Having failed to start a game since his strike against Sheffield Wednesday in the FA Cup fourth round, the 18-year-old scored another well-taken goal. Sarri might like to point to the first-half error which led to a Markus Rosenberg shot whistling past the post, which would have given Malmo the lead. The manager's reaction was one of fury and akin to the scalding that Jose Mourinho gave Marcus Rashford for missing a chance against Young Boys while Manchester United boss. But there is no doubting Hudson-Odoi is a fans' favourite. The Matthew Harding end of Stamford Bridge sung his name on several occasions, and after his third goal of the season serenaded him with regular appeals for him to stay after his £35m flirtation with Bayern Munich. Afterwards Sarri hinted for the first time that he wanted the youngster to have a future at the club, as long as the Italian remains. Asked by BBC Sport what Hudson-Odoi needed to do in order to start a Premier League game for the first time, Sarri said: "Callum has now played 14 matches this season and in England there isn't another player at 18 who has that number of matches in the first team. "So I think we are using him in the right way at the moment. Twenty matches this season will become 30 next and 40 in two years' time. "Also, the club has to decide because if I am the club and I want Callum on the pitch with more consistency, I have to sell another winger, otherwise the manager is in trouble." And with that comment - though Manchester City's Phil Foden and Fulham's Ryan Sessegnon, both 18, have played more than 14 matches this season - there are signs Sarri might be starting to listen to those who were calling for his head only three days ago.